The first time I encountered the problem of a buried lie was in the company of three other chaps much more experienced than myself. I was the last to tee off, was feeling a little nervous and consequently failed to make clean contact. From the tee, I could almost hear the plop as the sand flew up and my ball nestled in a fairway bunker. My companions raced off to discover the extent of my misfortune, and when I got to the scene of devastation I was greeted with a rather unsporting amount of mirth. Then, it happened. They almost shouted as one: "He's got himself a fried egg!" Now I don't know about you but I was more used to contemplating a fried egg as a welcome bonus in the clubhouse after an exhilarating early morning round, so to be informed that I had encountered one on the course was a little disconcerting to say the least. For the uninitiated, some explanation is called for, so here goes. 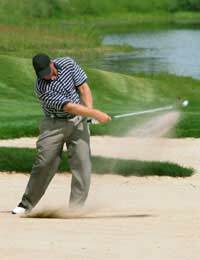 In golfing parlance, it refers to a buried lie in a bunker when only half the ball can be seen above the surface of the sand. So first off, forget the knife and fork in this instance, although having said that this type of fried egg will call for an equally unsubtle approach. And forget about making yardage or position because the aim is simply to get the ball out of there at any cost. Take the sand wedge, position yourself over the ball with your feet equidistant on either side, weight towards the front foot, and the hands forward of its position. Ideally you want the club head to descend steeply behind the ball, using a fair amount of force in order that it cuts down into the sand and, for want of a better phrase, digs the ball out. So steel yourself, stay calm, take a deep breath and go for it. What you are aiming for is for the ball to emerge from a mist of sand and out of the other side of the bunker. Addressing the ball, my companions cautioned, helpfully I think, that the thing to remember about a fried egg is that it is already cracked. Confused? Yes, I was, too. But what they were endeavouring to point out was that it was very important to avoid hitting the top of the ball. Why? Well, simply because failing to execute the shot properly and making contact with the ball rather than the sand behind it will only result in hammering the ball even further in to the sand, which would result in an even more difficult shot, and even more frustration. And probably some mischievous giggling from playing partners, too.I'm happy to report that I avoided further calamity and successfully extricated my ball from the sand. It didn't stop my companions regaling everyone in the bar afterwards about my first experience of a fried egg, but I'm glad to say that for once the yolk wasn't on me (ouch! ).